Girls Aren’t the Same is a fine Powerpop performance which somehow didn’t gain a release in the UK at the time. The harmonies and guitars are spot on, although the instant melody/hook can become a tad repetitive after a few plays. The B side is the killer in my book. Featuring Ian McKean driving and cutting guitars, Teddy Boy rocks out in fine straight ahead Stones/Streak mode. Ian’s style is pure Rock N Roll and he later also played lead guitar on 2 or 3 tracks of the second Fortunate Sons LP (Karezza) in 1986.
great single,I remember giving my copy to Mario around ten years ago,just the other day I converted my mini-disk saved copy of these songs to mp3...cheers,your blog is great fun! Been looking to hear the other side of this one for awhile. Where'd you find it? And I meant to add that the Chris Stamey/LX vocal styles on the A are pretty undeniable. Great! Not previously familiar with this, but I LOVE the way the guitars sound on the A-side! "Girls Aren't The Same" is an absolutely brilliant pop song and the B side is also fantastic. Excellent post. I've added PurePop to our blog. Wow I haven't heard that in years. I played guitar on a 320 Rickenbacker through a Vox on the A side and a Tele through a Ampeg Bass stack on Teddy Boy. It was recorded at Wessex Studios soon after the tragic death of Jim Ferrick our drummer so Mark,his brother played drums with a session guy on the B side. 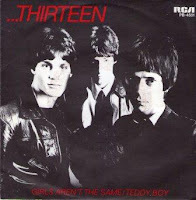 Th1rt3en were a brilliant power pop band that unfortunately came out at the wrong time, just as punk gave way to the mod revival. Had they come out five years later, or during Brit Pop or at any time in the noughties they would have been huge. Mark Ferrick, group founder and songwriter had an uncanny Beatles trained ear for writing concise and catchy pop songs. But with brilliant, pure rock'n'roll guitarist Ian McKean to give the songs a rough edge they also had a Stonesy quality about them. Mark unfortunately left London a broken man after failing to secure a proper recording contract after his music unbelievably fell on deaf ears. I have a tape of the band's demos that would have any power pop fan foaming at the mouth. Yes, they were THAT good. Just scroll down a bit. Unfortunately, you'll also see a segment there on Mark's older brother Billy, who was also a talented musician and composer. He died last year.